Albin Sheqiri takes a detailed look at just what makes Lionel Messi so special including his tactical intelligence, penetrative passes, role in defensive transitions and more. The 2014/15 season was one with many fine performances, some examples worth mentioning are: Juventus, Sampaoli’s Chile who won the Copa America for the first time ever and of course the ‘’tripleta’’ season of FC Barcelona. If there is someone to praise except the fantastic attacking-trio of Barcelona, it is coach Luis Enrique. He has fine-tuned the system of Barcelona, especially the way the midfielders now work in order to open up space for the talented strikers to work in, compared to Guardiola’s system, where the wingers were much more wing-oriented, which was even mentioned by Thierry Henry here. Having said that, I dedicate this article to Lionel Messi, a player that dominated and performed almost every single game and especially in the vital ones. Many compare the two great players by statistics which can be a fun thing to do, but is quite irrelevant if you ask me, due to the fact that it is much more important to try and watch/understand the player’s role and how he is influencing the game. For-example how and what the player is contributing to his team and the overall effect the player has for the team during the different phases of the game. The most obvious aspect is the way Messi affects the game in the attacking third of the pitch. Except the goals Messi scores in important games, the Argentinian is also much more ‘’active’’ and has more dimensions in his game than for-example Cristiano Ronaldo, who has a much more direct and one dimensional style of play. Messi is not only contributing in the more crucial zones of the pitch, but is also very useful as a winger, central based player (forward), false-nine or even sometimes penetrating the middle third of the pitch. Now to understand why and how Messi is able to perform in all of these ‘’roles’’, one has to look at his exceptional understanding of the tactical aspects of the game. 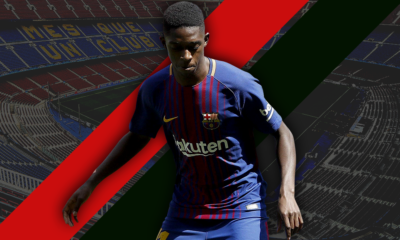 He has great vision and positional play which makes him very important for the team as he is constantly reading the game and knows when to drop deeper into the midfield to drag an opponent with him away from a space or create an overload centrally. To me, Messi is not only an extremely technically gifted player but does also contribute and affect much more in the tactical aspects of the game (as I’ve mentioned). That’s why Messi is a better ‘’team-player’’ than what Cristiano Ronaldo is. Now, reading this makes me question why one of the best coaches (at least tactically) praises the defensive qualities of Messi. Could it be that Guardiola is referring to that Messi is much more than an attacking player and by stating this he is basically noticing the overall football intelligence of Leo Messi? Messi has, due to his technical abilities, a lot of advantages when trying to solve the situations that occur within small spaces of the pitch, where there is a lot of intensive pressing towards the player in possession of the ball. This makes Messi a brilliant pressing-resistant player, because what is very obvious when watching Messi play, is how he controls the ball in these condensed spaces of the pitch (for example between the back and midfield line). Besides the exceptional technical abilities that Messi possesses, he boasts the ability to constantly read the situations during the game. This makes it look like Messi is always in the ‘’right place at the right time’’. Something that is also worth mentioning is that for a player like Messi to reach his full potential, there has to be good communication within the team. This also means that the level of the teammates has to be top level in these aspects. They have to understand and take advantage of the situations that the Argentinian wizard does create for the team, which raises the overall efficiency of Messi and the importance of his role during the game (something perhaps lacking when he plays for Argentina). 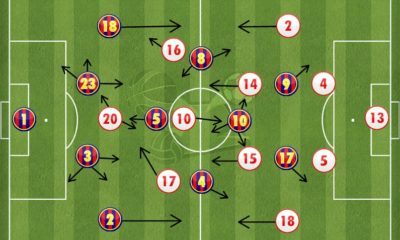 Here we can see the positional play of Barcelona. Notice how Xavi has occupied the space that Messi has left , due to Messi penetrating closer to the opposition goal. …and he almost invites the opponent to press him before, dribbling away from the situation (notice how the Bilbao defense is ball watching). This is a good example of how Messi is a good pressing-resistant player, because he does everything here, except be flustered under pressure. What Messi does instead is to wait for the pressing of the opponents to make them leave their positions and then dribble his way out of the situation and pass it to a teammate with more time and space with the ball. This is something that is called ‘’La Pausa’’ and has been explained here. It is basically a move when a player is in possession, he waits to invite the opponent to press which will make them leave their positions and open up gaps between the lines. Notice here how free Rakitic is, and how Messi after easily feinting past 3 players, has forced the Bilbao defense to shift over in relation to the ball. Now by doing the ‘’La Pausa’’ he tricked the central midfielder closest to the ball into blindly pressing which the other central midfielder in a more isolated position. …passes it back to Rakitic and continues his roaming. Neymar then drops into the half-space to drag the fullback of Bilbao with him which opens up a huge gap for Messi to penetrate into. This can be used as a great example for a good communication level within the team. Rakitic plays it to Neymar who plays it on via a one touch pas through to a free Messi. It leads to a 1vs1 situation for Messi & Suarez inside the penalty box. As we can see by analyzing this sequence, Messi does not only dribble just because he is so dominant in doing this, but is also rather used as a strategic advantage. What this kind of tactic/strategy can be named as is a ‘’offensive press-trap’’ which is explained by Adin Osmanbasic here. This means that the attacking team is basically inviting the press of the opposing team in a specific area of the pitch to make the opposition leave their positions and focus on the player in possession, which is used to then open up space for the remaining players. Examples above do prove how Messi has 1: dragged one central midfielder of Bilbao away from his position and then 2: forced them to defend too close to each other, basically destabilizing the entire midfield line of Bilbao. Above is a situation where Busquets is threatening the space in front of the Bilbao defence. Notice how Messi is not roaming into the space behind the defensive line of Bilbao, but instead moves into the space that I have marked out for you. In my opinion Messi does this due to the fact that he has perceived that when Busquets it threatening the space in front of the defence , this makes the Bilbao defence ready to retreat in order to stop any ball being played behind the defensive line vertically. This makes Messi’s roaming into this space maybe a bit too predictable. Messi is now in possession of the ball with enough space in the ‘’zone 14’’ (statistical zone of where the most goals do occur). This means that Messi has created space for himself, by perceiving and reading the situation to come up with the most efficient solution for him and the team. Graphics 3 and 4 show how Messi is threatening the space and ‘’forces’’ many Bilbao defenders before (thanks to his individual qualities) dribbling his way to create space for himself and threaten the ‘’new’’ space. This sequence shows how many defenders Messi has occupied and how he is solving these condensed situations closer to the goal. In this situation Messi has created space for himself and threatens the space that has opened up centrally in front of the Bilbao defence. Due to his amazing ability to threaten space with explosive runs though still having incredible control over the ball, he is occupying a lot of defenders at the same time, which opens up spaces for his teammates. The Bilbao defence is very crowded and again ball watching. …whom Messi finds with a through pass, through the entire Bilbao defence. What you can notice is how Messi, wisely roams into the specific zones to occupy players as shown in the first sequence in picture 4, where he is occupying 3 players at the same time and then continues into the space that Neymar has created for him to run into behind the fullback of Bilbao. The whole attack looks almost as if it has been planned in advance by Messi which mirrors the legendary quote of Cruyff that: you’re either in the space or you’re not. And Messi is guaranteed to be there. Something that has been very common and efficient during Enrique’s reign, is Messi’s role in the flanks (as a winger). The strategy employed here is basically the same as mentioned above, but maybe in spaces more far away from the goal with another variant. This was seen during the CL Final against Juventus too. Personally, I do enjoy the positional play of Luis Enrique and how he has adjusted the details tactically. 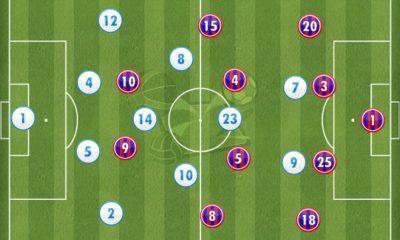 The positional play opens up spaces for the Barcelona players which are to destabilize the opposing team, in some cases to such an extreme that it has forced the opposition to switch their defensive organization in specific areas of the pitch. This positional play is especially benefiting a player such as Messi, as it makes him unpredictable and gives him the freedom of penetrating wherever he wants to, though still without losing the overall balance within the system of Barcelona: when Messi drifts inside, Rakitic occupies the space that Messi opened up – sometimes this space is occupied by Suarez and Alves – depending on the situation of course. Messi is with his back against the goal, being pressed by the Bilbao player. Messi body feints and threatens the space towards the flank to invite the defensive shift of Bilbao towards the flank, to then once again shift into his left foot to get a better overall view of the play. In a situation like this, Messi is far away from the goal, but is still affecting the game hugely. What I mentioned earlier is seen here. The white arrows are there to show how Messi has forced the Bilbao defence to shift towards him, by inviting the press towards him, which leads to ‘’over compactness’’ of the Bilbao defence which is mentioned by Tom Payne here. This is a very common variant used in the attacks of Barcelona. Since Messi has incredible individual qualities, he solves the situation from one flank to the other as it has opened up space for Barcelona in the other side of the pitch. This is when Messi does attempt to play his diagonal passes (black line is to show you the last defending player of each defending line, proofing how compacted the lines of Bilbao are). Diagonal ball has been played to Neymar who has a 1vs1 situation (again) inside the penalty box (eventual 2vs1 situation, with the overlapping Alba). Notice how the diagonal ball has affected the Bilbao defense, whose defenders are now forced to defend against their own goal instead of in front of the goal and the ball. Messi drifts inside (notice the pattern of positional play/switch of positions of Barcelona) which means that Rakitic moves out wide. Messi starts to threaten space which affects not only the first line of defence from Juventus, but the entire defensive system, which is forced to shift across to close space in relation to Messi and the ball. In this situation though, Neymar drifts inside into the half-space to occupy the fullback of Juventus which creates a huge gap for Alba to penetrate into. …a 1vs1 situation for Alba with a huge gap for Neymar in the penalty box. As in the Bilbao game, the opposition is now forced to defend against their own goal instead of in front of it. What one might tend to forget when watching Barcelona is how efficient they are in their defensive aspects of the game (especially the transition to defense part + counter-press). Barcelona is known for being dominant in terms of possessing the ball which means that the majority of the play is in the opposition half. Last season Barcelona had an overall statistic of 67 % possession, highest of all teams in Europe. 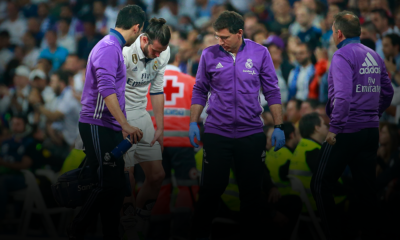 This leads to Barcelona wanting to win the ball back as soon as possible when eventual loss of possession occurs and prioritize the most efficient way of stopping the transitional phase that occurs when losing the ball, to be in this phase as little time as possible. What can be analyzed is the way Messi is able to press in these situations and how efficient he is in his pressing. What may surprise you is that during last season Messi had 75 % of successive tackles when recovering the ball. Stats shows how many successful tackles/recoveries of the ball that Messi had during the Champions League 2014/15 season. 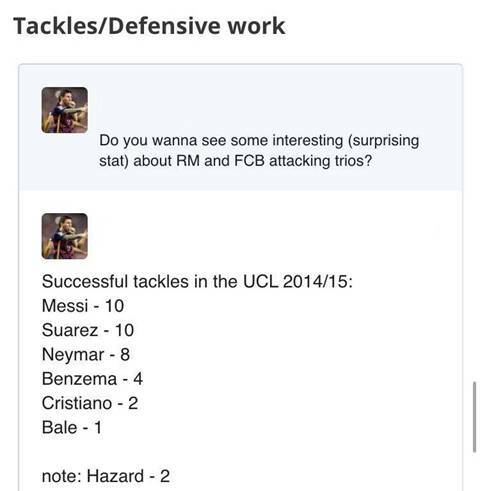 We can see that Messi and Suarez are both listed as the ones with the most successful tackles of all attacking players in the Champions League 14/15 season. Neymar plays a vertical ball that is stopped by the Levante defender. Messi then immediately starts his pressing towards the ball. While pressing the player he is also covering the passing lanes (cover shadow) by slightly running across this lane before continuing his run to the ball, to force the opponent into a less dangerous space, in this case the flanks. Player #5 in Levante is forced to play the ball back towards their own goal due to the counter-pressing of Messi. Messi continues his pressing towards the new player in possession while cover-shadowing the passing lane the ball came from. Which eventually leads to recovery of the ball, but now much closer to the goal. Is there more to say when it comes to Messi and how he affects the game for Barcelona in the different phases of the game? Yes, a lot, but I have tried to include the most crucial ones. I personally believe that there are no better pressing-resistant players in the world than Messi and his fellow teammate Busquets. They are able to solve complex situations which require lot of intelligence and technical abilities especially in condensed spaces. 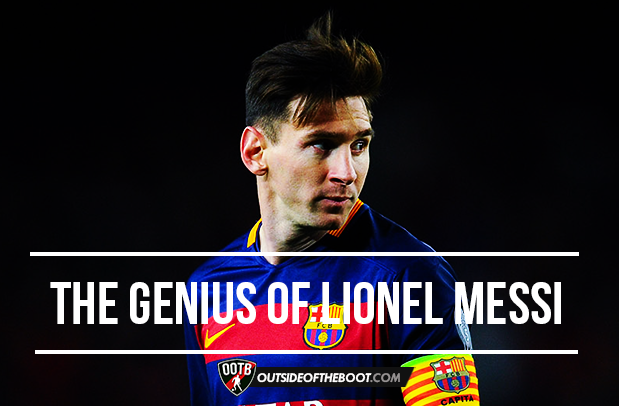 In addition to Messi being such an extraordinary dribbler at high pace, he also is a very intelligent player. He is able to (as Busquets) decide the tempo of the game during possession of the ball and execute the right actions to decide games. And if you’re still not convinced, as a parting note I leave this article by ex-Barcelona player Xavi, who is full of praise Messi’s tactical intelligence. Austrian fan culture: Lessons to be learned for the Premier League?